Traveling to Muslim majority countries, you may find some things that do not seem to jive well with our (Western) understanding of Islam. I remember living in Fez in Summer of 2005, where I encountered other Western Muslims who had to come to terms with the contradictions of tradition and Islam. There were two British Muslims, one a convert and another from a South Asian background, who were so appalled by folk religion that they wanted to high tail it out of there. As Salafis, they condemned the innovation they saw everywhere. I wasn’t as interested in condemning Morocco as a whole country. My rudimentary training in ethnography gave me a certain tolerance for folk religion. I was interested in the roots of some practices, whether or not they were indigenous and reflected Berber folklore or influenced by sub-Saharan African traditional religions brought over by descendants of slaves. The previous year, I had travelled to Morocco for a six week summer program. We went to various sites to see cultural and religious practices. On one of these trips, we passed by the shrine of Moulay Idris II in Fez, noted as a women’s masjid. You can enter Fez’s Old City in one of several gates and walk through winding narrow streets that are like arteries in an organic body. Buildings merge into the ancient city scape, and your senses are assaulted with all sorts of sights, smells, and sounds, some good and some bad. At Moulay Idriss, women light candles and burn incense for fertility. I remember seeing padlocks tied to the grate. For hundreds of years women placed locks on the grate after praying to Moulay Idriss to help them solve a dilemma, a difficult husband, unruly child, or help them conceive and deliver a child. Today, students place the padlock for their examinations. I was never a superstitious Muslim, but I heard my fair share of scary Jinn stories. In a society where there is a 25% unemployment rate and most people are underemployed and poor compensated, hard times are often blamed on curses and jinns. Just as psychological illness is blamed on Jinn. 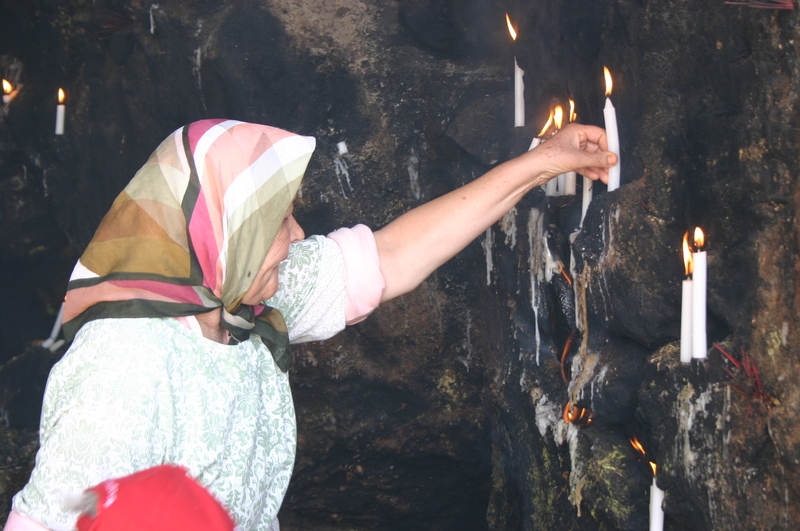 Once, we visited the shrine of Sidi Hamdush and saw the oracle that was just below the shrine. The View from Fez has some beautiful pictures of the Moroccan Sufi Festival Sidi Ali. Out of respect and fear of reprisal, I did not take pictures of the oracle, the man who did not cut his hair, beard, and seemed to not have bathed in months. Outside of the oracle, was a line of shops selling items that a pilgrim could sacrifice at the oracle. The oracle would read look at people and tell them what jinn was possessing them and possible ways to excorcise that jinn. Moroccan authorities are very uncomfortable with Westerners visiting these places, mainly because they don’t want to draw too much attention to controversial ecstatic sufi practices. Near the shrine, was a spring where women bathed with hopes that it would help with fertility. Once I remove that scholarly lens, I try to think about what do these experiences mean to me as an American Muslim. It raises important questions regarding espousing beliefs that run counter to the belief system we espouse. My observations in Egypt, Kuwait, and Morocco help me see that no one society has Islam on lock. In order words, we all have bits and pieces that we try to string together. My experiences remind me how easy it is to continually incorporating thought patterns and belief systems which run counter to tawheed. Importantly, it makes me grateful, in many ways, that I have access to learning where I was able to learn about Islam relatively free from cultural baggage and superstition. Islam freed me from perpetual fear of jealousy, curses, randomness, capricious spirits, and emptiness. I’ve learned that Allah has my back and I don’t need to go to a special holy person to pray for me or carry around some amulet to protect me from harm. There is no transformation or power except through Allah. Although I do like to see Christian-Muslim cooperation, I prefer my candles the nice scented kind!! its a site dedicated to dismanteling stereotypes about black women, you should join and post about your experiences, there are all kinds of people who post. But anyway, I am not advertising, I am studying arabic, are you studying abroad, fluent or learning? ?